I spent a day this past weekend catching up with my family–my parents, my sisters, nieces and nephews. Typical of most of our family gatherings, the day was centered around food. The large, round table at the restaurant overflowed with more food than we could eat. It was always this way growing up–everyone was free to order their favorite dishes, all served family style…and it’s never a quiet affair when my family gathers together. Once or twice I looked over at my brother-in-law to see any signs of being overwhelmed, but after years of being a part of our family, he seems to have grown accustomed to the high-decibel conversations. We teased, laughed, I tried to convince my father to share his homemade longganisa recipe (sausage) here on the blog. My father passed around an iPhone snapshot of my mother’s shadow, aka her black cocker spaniel, Miss Bailey, who apparently sits smack dab in the middle of the cul de sac while waiting for my mother to come come each afternoon. When she’s home, Bailey is always behind her. It’s no exaggeration that we call her my mother’s shadow. But you know what I found most amusing (and endearing)? On my left was my youngest sister being quicker than I was to take pictures of the food as it was served (all for Instagram) and on my right was my mother saying, “Here, take a picture of me and your Papa.” She had finally upgraded to an iPhone and was very excited about capturing each moment as it happened. It’s days like this one that make me feel bad for living two hours away from everyone. At home the following day I was inspired to make breakfast in the middle of the afternoon. Chocolate waffles had been on my mind but I had no one to serve them to. If I had all my six nieces and nephews with me I would not have had second thoughts. I was home alone and I couldn’t get an idea out of my mind. And who can ever resist a chocolate craving? So I went with it. I tweaked my favorite Belgian waffle recipe again by adding cocoa powder this time (I’ve stuffed it with bacon and cheese before). And since there’s no sugar in the batter, I also threw in some chocolate chips–not a lot, just enough. I’ve seen recipes online for chocolate waffles and more than a few of them are described as having a pancake-like texture. Not so these waffles. The yeast-leavened batter and the egg whites make for a crisp exterior and airy interior. But what took these waffles over the top was the caramelized bananas that crowned them. I had some bananas sitting on the counter and as soon as I set eyes on them I knew they’d be perfect with the chocolate waffles. Cooked in butter with a sprinkling of sugar the bananas added so much to the waffles. I nibbled on two waffles while I cooked up the batch and after I finished taking pictures for this post, I still couldn’t resist digging right in. In fact, if you decide to try this recipe I’d advice you to keep a close watch of your plate. I set mine down on the kitchen counter while I put away my “set” for the photo shoot in the other room. I didn’t hear my husband arrive home and by the time I returned for my waffles my plate was empty! If they were big-kid approved I have a feeling my nieces and nephews would love them, too. Dissolve the yeast in the water in a cup or small bowl. In a large bowl, stir together the flour, salt and cocoa powders then whisk in the yeast mixture, milk, butter and/or oil, egg yolks and vanilla extract. Whisk until the batter is smooth. In another bowl, beat the egg whites until soft peaks form then fold them into the batter. Let stand for about 20 minutes. Preheat your waffle iron in the meantime and fold in the chocolate chips before you use the batter. I spray my waffle iron with cooking spray before I use it (after preheating). Pour some of the batter into the iron, about ⅓ cup or more, and cook until they’re ready. My waffles were ready in about five minutes. If you wish, transfer the waffles as they cook in a warm oven until all are ready. To prepare the bananas, heat a pan over medium to medium-high heat, add the butter. When it's hot, add the banana slices and sprinkle with sugar. Cook for about one minute on each side. Any longer and the bananas will get too soft. 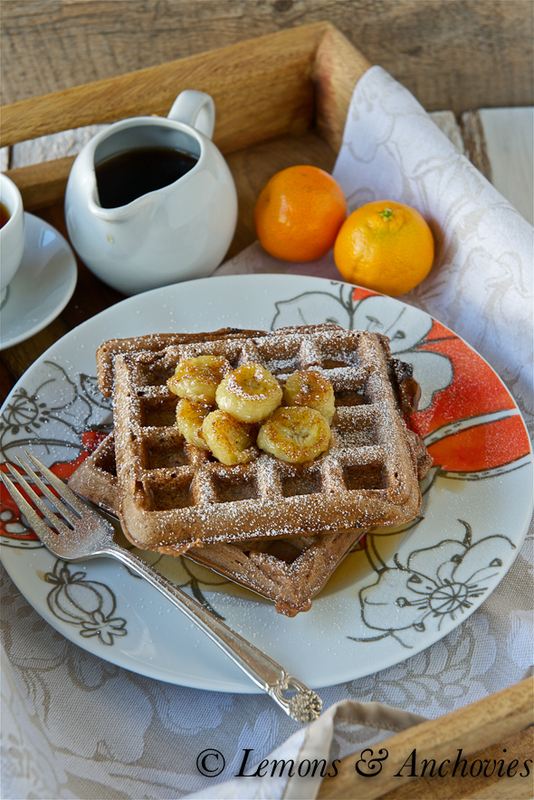 Plate the waffles, arrange banana rounds on top, drizzle with maple syrup and dust with powdered sugar. These sound so good. They look great too, I’ve never had yeast waffles before. I wonder if you could make them sour dough? These would make such a lovely weekend breakfast! I’m not sure what I like more, the chocolate or the caramelized bananas! Did you have to post this right as I was getting ready for bed, lol? Now I’m not going to be able till wait till morning to think about breakfast. Sounds like you and the family had a blast. Hope you New Year is going great. They look so incredible, I am in love with the taste of caramelized bananas! I just bookmarked these for the upcoming weekend. I have never made Belgian waffles before .. They sound too good to pass on them.. Especially with the addition of chocolate! And the caramelized bananas – oh my! Yep, totally making these on Sunday! Jean, I don’t know if I would share these waffles with anyone… it’s kind of known around here that breakfast food is for me, only! I love the combination of chocolate and banana. These waffles look incredible! Ah ha, a waffle thief in the house! I say we should eat when we are hungry and not be dictated to by convention. My son has always done that and he is still lean and mean at 22, not an ounce of fat. That sounds like a great family get together. They are probably super special because you don’t get together that often. 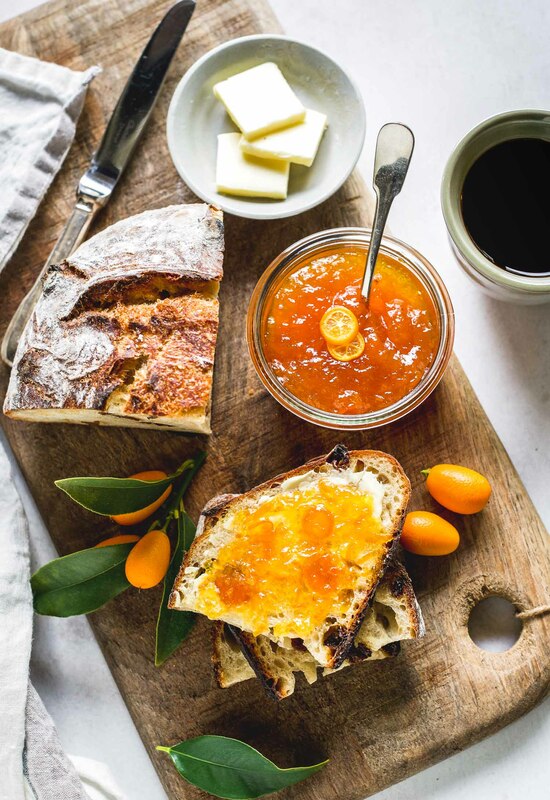 These look like the perfect Sunday morning 10 am breakfast! Your photos are beautiful. I live 2 hours away from my family, too, so I feel you on missing those special moments! But o-m-g, I cannot get over how perfect these waffles look. I’ve really gotta get a waffle maker. The perfect topping for chocolate waffles! 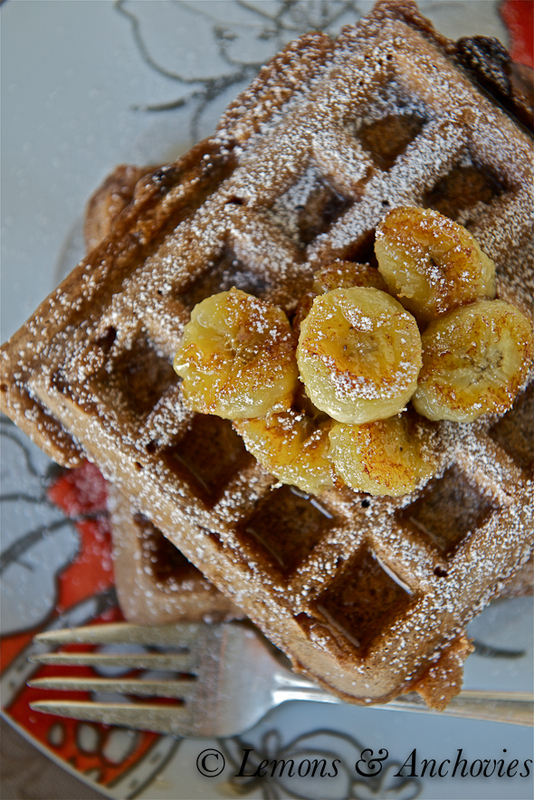 Waffles are a huge favorite at my house especially chocolate ones but now I must do the bananas! Jean – sounds like you had a wonderful day with your family. 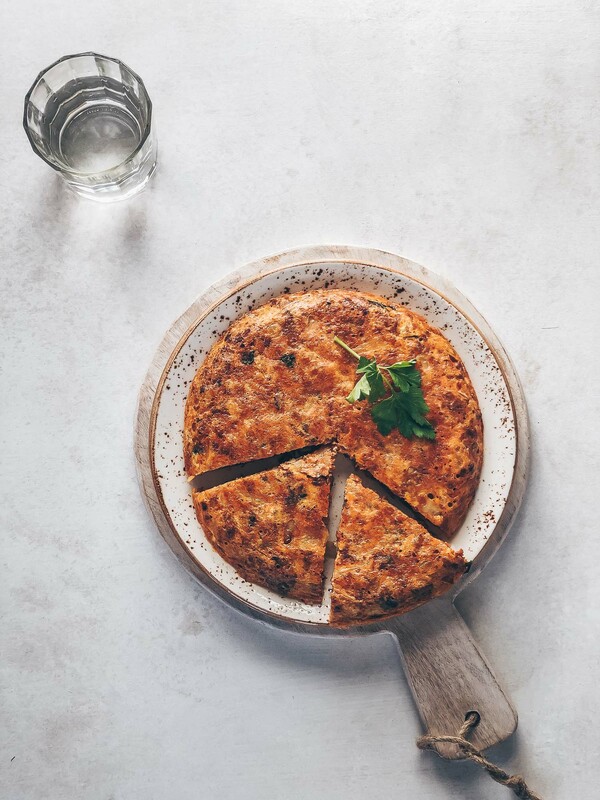 Love that everyone wanted to take photos of the food – are you rubbing off on them? Smile. These waffles look and sound amazing!!!! Need to make these for hubby – he would adore them! Sigh. Along with an ice cream maker, a waffle machine is on my kitchen gadget wish list. I only wish we have enough kitchen space in our tiny condo for these special equipment….I think I will try to make room in our equally tiny locker space for a waffle maker. 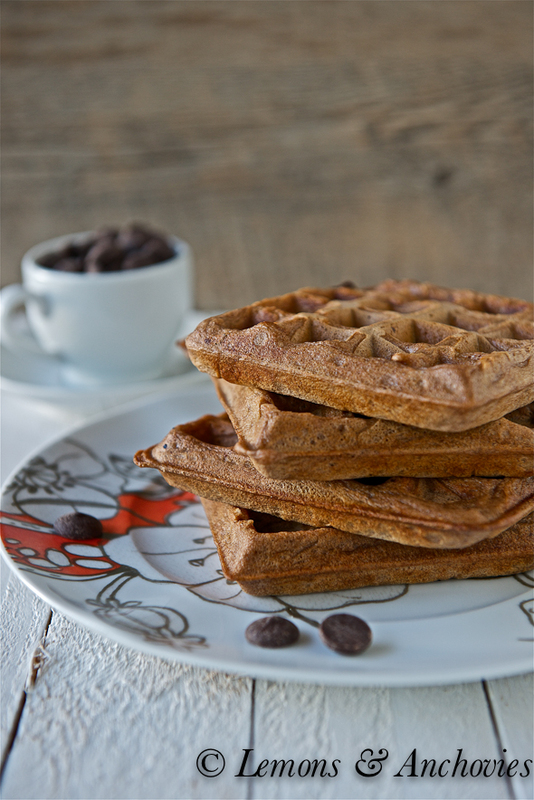 Waffles just scream “Sunday morning breakfast” or “vacation holiday breakfast” to me! And since my kids are always screaming about L’Eggo waffle commercials on tv, I know I only have to buy a waffle machine to win their hearts! Thanks, Jean, I think you’ve sold me on one! Hahaha! I have never made yeast waffles before. We like waffles around here, I have just never branched out for the recipe I got when we got married 🙂 You know I like chocolate, so I love these! I prefer my breakfast in the middle of the afternoon…sometimes even at dinner 🙂 And what a scrumptious breakfast this is…delicious! ….We eat waffles almost every other day (shop bought)….I think it’s high time I start making them, yours looks so perfect. !